Last week I talked about a fabulous new mascara that I had the opportunity to try. That post inspired this week’s post: How to Make Your Eyes Pop. The eyes are one of my favorite features to highlight when I do my makeup and I thought it would be a great time to share my favorite products with you! Check out the top 6 beauty products I use everyday [in the order I use them] to make my eyes pop. 1. 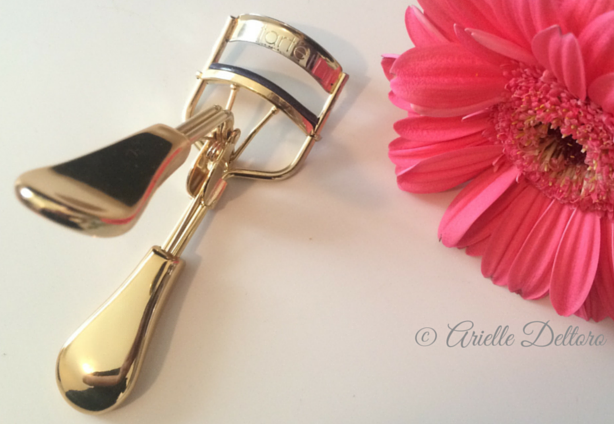 All Day Hold Eyelash Curler: my favorite eyelash curler right now is this glamorous gold Limited-edition Picture Perfect™ Eyelash Curler from Tarte. It won’t matter if you use the best mascara if you don’t start off with nicely curled eyelashes! I’ve found that this eyelash curler is one of the best I’ve ever found, and I love the no-pain finger grip. 2. Black Eyeliner for the Upper Waterline: the Waterproof Smudge Stick from Stila in Stingray Jet Black is my absolute go-to. Use it to line the inner waterline of your upper eye in black to really define your lash line. 3. Black Eyeshadow and Eyeliner Brush: I use the black shadow in this limited edition 7 color Lorac ‘Skinny Black Palette’ [from last summer’s Nordstrom Anniversary Sale] on the outside of my lower lashline to create even more definition on my eyes. 4. White Eyeliner for the Lower Waterline: the Sephora Collection Eye Pencil To Go in Pure White is the ideal product to use on the lower waterline. Use it to line the inner waterline of your lower eye to make your eyes look big and really pop! This is one of the items that you absolutely shouldn’t skip. It’s an everyday must have, even if I’m not throwing on any other makeup. This liner makes you look fresh and awake… even if you skipped some much-needed beauty rest! 5. Fabulous Mascara: my top 3 picks of the moment are 1) Marc Jacobs – Velvet Noir Major Volume 2) Benefit – They’re Real 3) Make Up For Ever – Smoky Extravagant. It’s so hard to pick just one favorite, so I’ll say that all three of these are winners. They’re on rotation in my daily makeup routine and I would buy all of them again. 6. Fool-Proof Liquid Eyeliner: my top 2 go-to eyeliners are 1) Kat Von D Tattoo Liner in Trooper and 2) Stila Stay All Day Waterproof Liquid EyeLiner in Jet Black. I think I lean towards loving the Kat Von D liner a bit more than the Stila, but they’re both truly amazing liquid liners and I have them both on heavy rotation in my daily makeup routine. You’re very welcome. Thank you for checking it out! I’m glad I could suggest something new. Let me know what you think once you try it!